I love South Park, the Comedy Central television show. I hate almost every South Park video game. The one exception to that was the Xbox Live Arcade game, South Park Tower Defense. My appreciation for the downloadable title was more due to it being a solid tower defense game since it didn’t do very much with its source material. 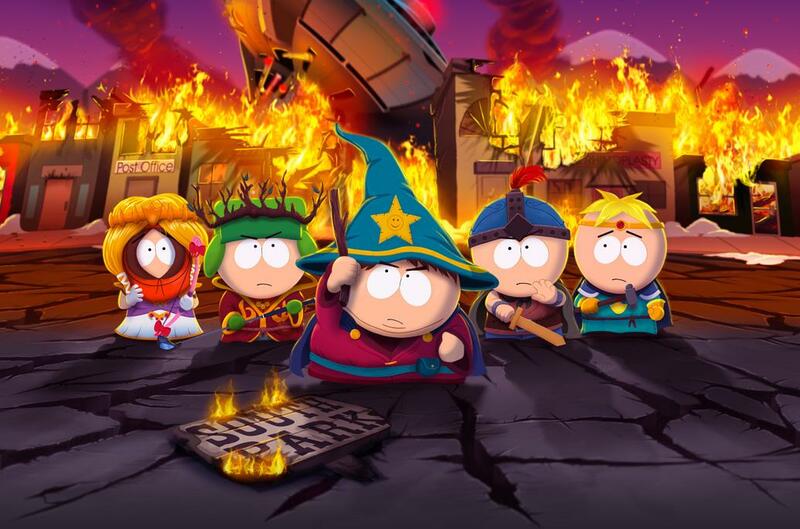 Now there is another South Park video game I don’t hate. In fact, just like the show, I love South Park: The Stick of Truth. “Just like the show” is a perfect summary of what The Stick of Truth is. While most good licensed games (The Arkham Series, High Moon’s Transformers prequels) are well made games that happen to star some of your favorite fictional characters, Matt Stone and Trey Parker, along with Obsidian Entertainment, have made an excellent 12 hour long episode of the show that happens to have some good and surprisingly deep RPG gameplay in it. The Stick of Truth opens about a day or two after the end of the show’s Black Friday trilogy. While it is not necessary to watch it, I would highly recommend it just for a bit of added back story and you can also view it for free on southparkstudios.com. After a short intro from Cartman that explains the state of the world of Zaron, you get to create your character, lovingly referred to as either “New Kid” or “Douchebag” throughout the game. The creation tools are wide and varied from the start. 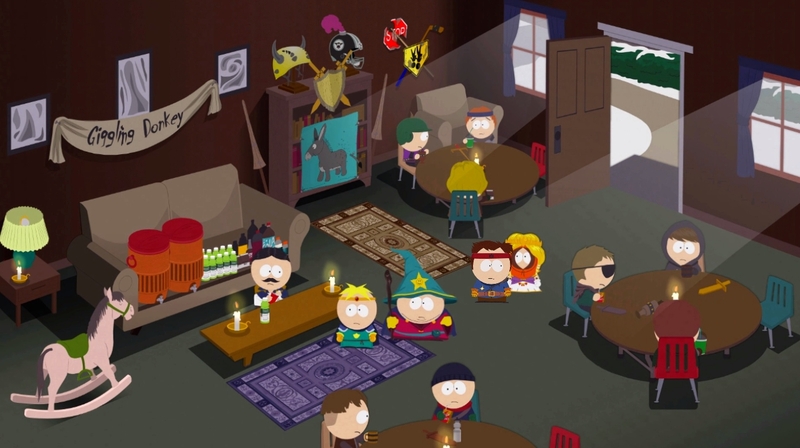 You can make almost any male South Park kid you can imagine from the go, and after jumping in to the town of South Park, cosmetic items are around every corner just waiting to be picked up, tried on, and replaced. As stated before, there is no gender option in the character creator. This is due both to a story arc in the game that wouldn’t work if your character was female, and just how the young girls of South Park are perceived within the show, they usually don’t like to interact with the boys unless necessary. This becomes less of a problem since the cosmetic items can even allow you to take on the appearance of a girl. Before the New Kid can start exploring South Park and changing his look, he has to choose a class and become part of the KKK (Kingdom of Kupa Keep) so he can start playing in the town-wide LARPing game that all the other boys have taken to. The four classes fall under the average types for a game of Dungeons and Dragons. You have your basic warrior whose brute strength can break through most armor, the wise mage can cast spells causing various status effects, stealthy thieves can slip between enemy lines and backstab or cause bleeding damage to enemies between turns, and finally we have The Jew. The Jew is a monk/paladin class capable of healing and smiting enemies with holy damage. The different classes and abilities can play heavily into the approach of combat. I say “can” becomes combat sometimes becomes too easy, especially since characters can self heal and attack on the same turn along with any weapon being available to all classes as long as the level requirement is met. So yes, it is possible to brute force your way through the majority of The Stick of Truth without worrying about status ailments and debuffing your enemies, but I found it much more enjoyable to delve into those features, unnecessary though they may be. Weapons can be modified through “strap-ons” and armor can be enhanced with patches, both obtainable through loot after battles and chests scattered throughout South Park. All equip-able items besides cosmetic only wigs and makeup are level locked, though the level cap is only 15 which is easily achieved by the end of the game given players side quest a little. Each level feels like it’s own reward, letting players equip the newest armor, weapons, and beefing up their class based abilities. Along with the abilities specific to the class you choose, players also gain abilities throughout the story. The majority of these abilities affect how you interact with the world more than they assist you in combat. They all center around accessing areas that were previously walled off due to one reason or another, but it never feels like a hassle going back to explore since the world is so much fun to take part in. Even the fact that I have wrote so much about this game while barely touching on it’s source material shows just how deep The Stick of Truth’s gameplay can be, but don’t get me wrong, this is a South Park game and all the gameplay is just a vehicle used to deliver the series signature wit and over the top humor. The Stick of Truth is a beautiful game in that it looks exactly like the show. From the way the kids bounce instead of walking to the more well known locales like the school, everything looks exactly as you would imagine it from the show. The game does hitch a little here and there on consoles, but due to the art style it never becomes more than a very minor noticeable trait. The look of South Park isn’t the only thing nailed down here. With Matt Stone and Trey Parker penning the majority of the game, The Stick of Truth is one of the funniest games I’ve played, well, ever! Never overstaying it’s welcome or running the jokes into the ground, Trey and Matt found the perfect length and balance for each segment, set piece, and fight. As is common with the show, the game parodies other games, and while it doesn’t solve the issues that it pokes fun at, it also doesn’t commit a cardinal rule of gaming and make a joke about a bad mechanic then perform that exact mechanic. Any satire towards games here feels fresh and funny throughout. I would love to give examples but spoiling any jokes in a game like this is just as bad as spoiling the story for a narrative heavy game. I guess the one warning I would give about South Park: The Stick of Truth is that if you don’t like the show, you will not like this game. Every detail, through and through, is surrounded by what makes the show what it is. If you aren’t okay with that, save your money. If you are, like I am, then what are you waiting for?! Go experience gaming’s best use of a license to date!